Despite being released on August 22, hardly any devices outside of Google's Nexus and Pixel lineups officially run Android Nougat. In fact, only about 0.3% of all Android devices with the Play Store actually have it. 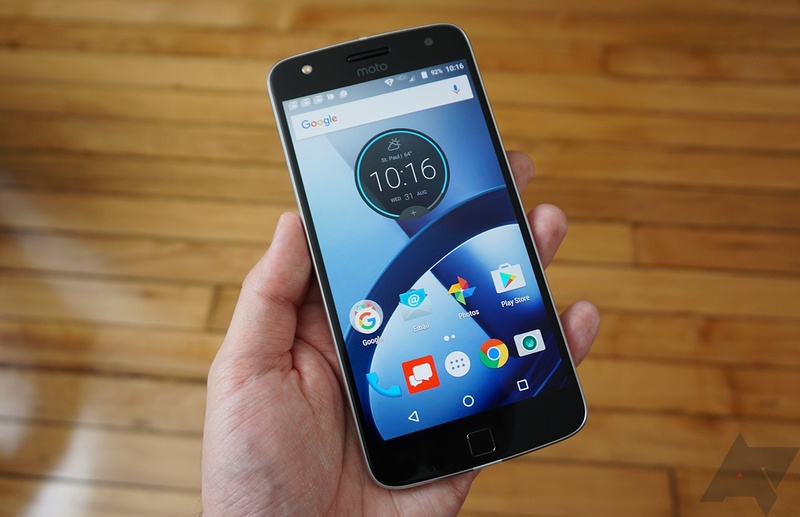 Many Verizon customers have reported that their Moto Z Droid and Moto Z Droid Force phones have received OTAs to Nougat. Motorola is trying something new—it's like a whole new company with new owners, new phones, and a new approach to making money on said phones. 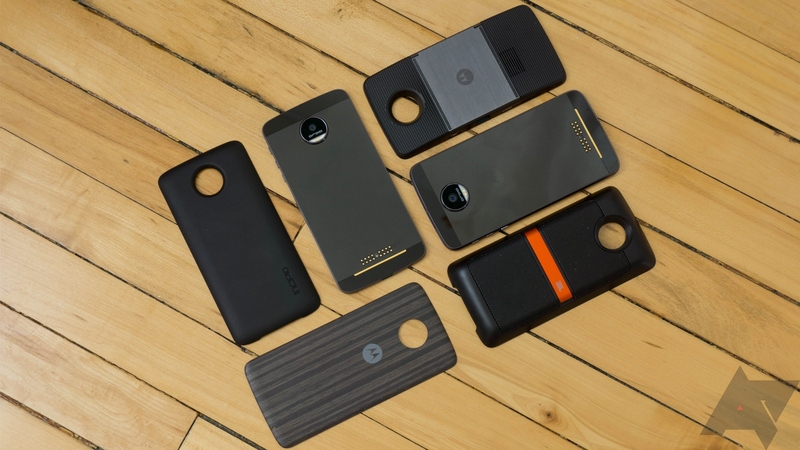 The Moto Z and Z Force (currently only available as Verizon exclusives) are "modular" phones with a series of snap-on rear panel accessories. They're also very thin and lacking a headphone jack. There are certainly reasons to be skeptical of these devices, but they're also very interesting in an industry that has had trouble innovating beyond the standard black slab. We've learned a lot since Lenovo's (this is still a bit difficult to say) Moto Z and Z Force were announced last month. First, that they'd be launching as Verizon exclusives (unlocked versions are scheduled for September), then that they don't have a 3.5mm plug but do come with a USB-C to 3.5mm adapter, and have 2 years of free original quality Google Photos uploads. Pros... and cons. 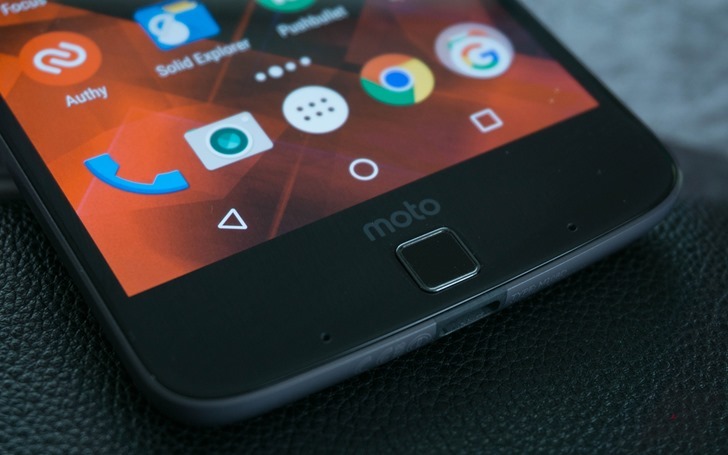 We also heard rumors about the different Moto Mods' pricing, but no date or prices were fully confirmed until today. As of now, you can pre-order the Moto Z DROID, Moto Z Force DROID, and the Moto Mods from both Motorola's and Verizon's sites. 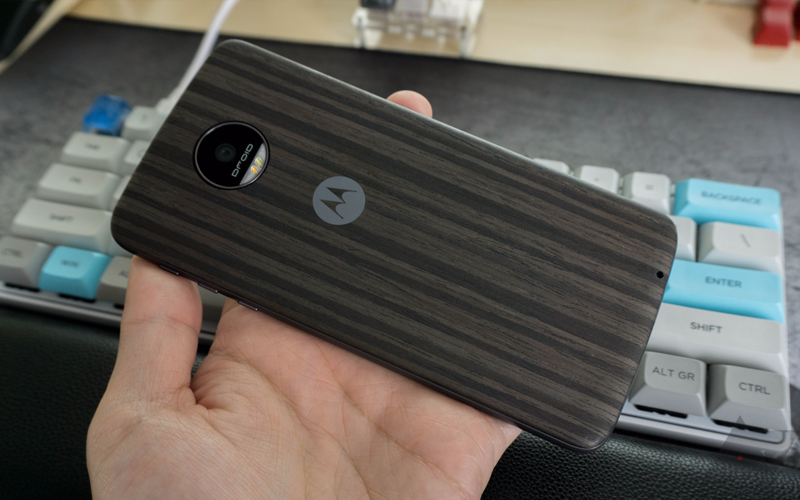 Before you do, you may want to check Ryan's first hands-on impressions of the phones (full review coming later) and David's impressions of the Moto Mods. 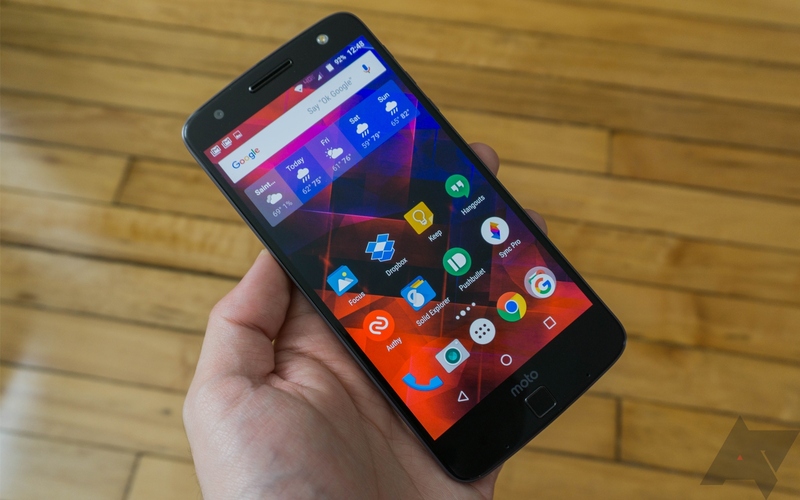 If you ask Motorola, Mods are the story with Moto Z. If you ask most smartphone enthusiasts? The Mods are decidedly not the story - they're just accessories. Well, which is it? 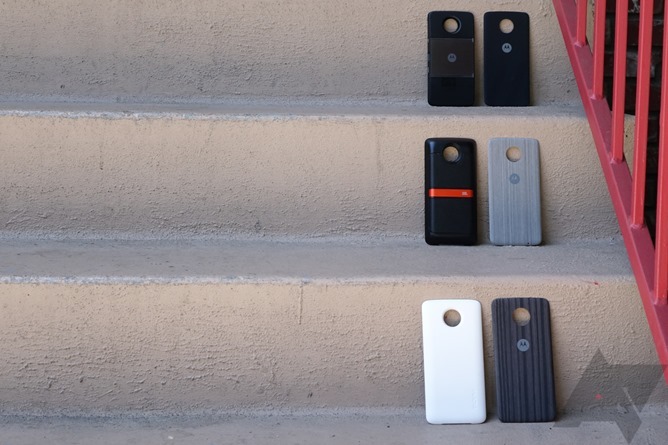 Are Motorola's modular pieces central to the authoritative and complete Z experience, or are they forgettable add-ons? I've had a few days to play with them, and while I am not "reviewing" any of them here, I am going to share some thoughts on them. First, we have the not-really-Mods: the style shells. 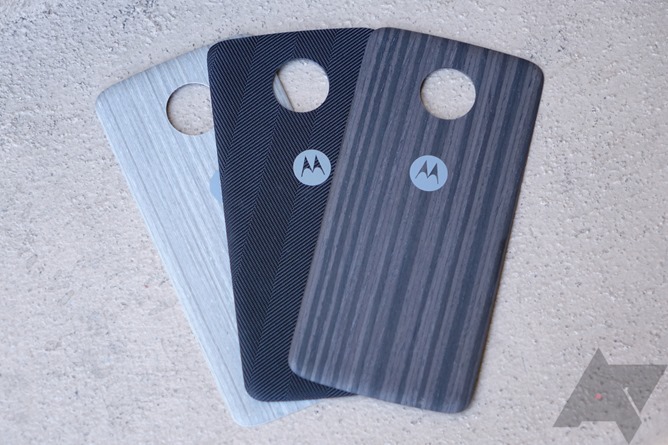 Moto sent out two woodgrain shells and one that I would describe as a black nylon fabric weave. 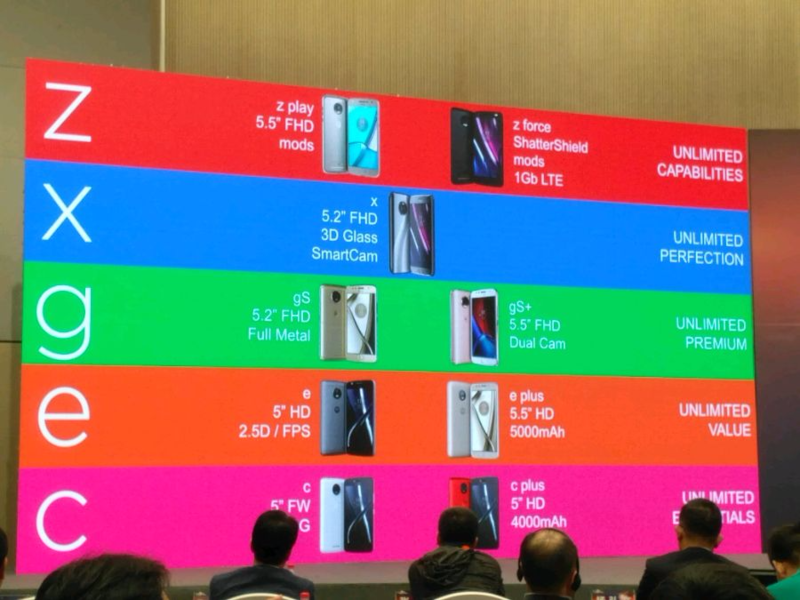 Motorola under the stewardship of Lenovo is doing something very different this year. The Moto X brand may not be gone, but it's certainly not the company's focus right now. Instead, we have the Moto Z and Moto Z Force. They're thin and they have Moto Mods—snap-on modules like projectors and speakers that make the phones much less thin. The Z is coming to Verizon first as a Droid phone (that's what I have to review), but the device I'm looking at now is very similar to what Motorola will release unlocked later this year. Yesterday, the Moto Z and Moto Z Force were unveiled by the new owners of the Moto brand, Lenovo. The devices showcase some bold, if controversial, design choices. While they may be lacking headphone jacks, they are not lacking for power or top-notch specs worthy of their flagship designation. To help you sort out the differences between the two, we've prepared this handy-dandy chart. Clean your glasses and turn up your screen brightness – it's specs ogling time.